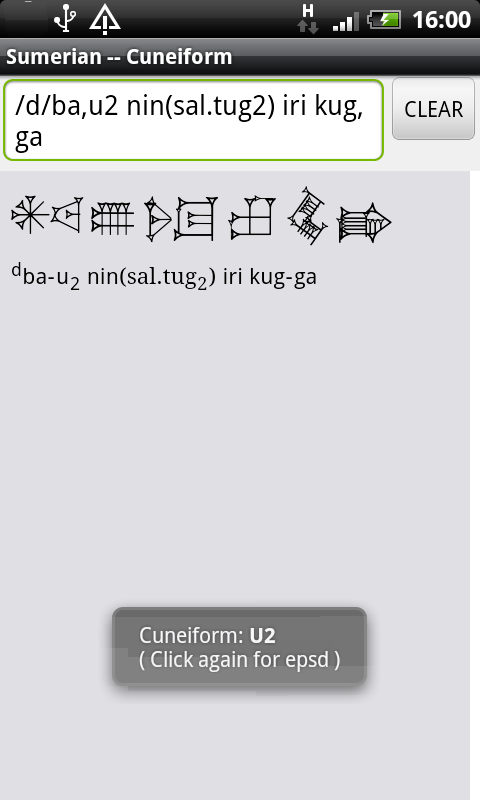 "Sumerian Proverb of the Day"
Based on the ETCSL collection: Black, J.A., Cunningham, G., Ebeling, J., Flückiger-Hawker, E., Robson, E., Taylor, J., and Zólyomi, G., The Electronic Text Corpus of Sumerian Literature ( http://etcsl.orinst.ox.ac.uk/ ), Oxford 1998-2006. 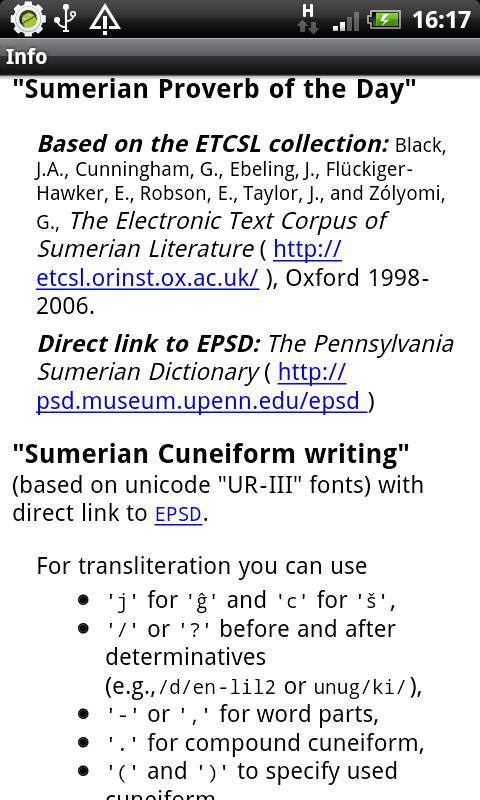 "Sumerian Cuneiform writing" (based on unicode "UR-III" fonts) with direct link to ePSD. Something offered is not offered. Something finished is not finished. A disorderly son -- his mother should not have given birth to him. His god should not have created him. 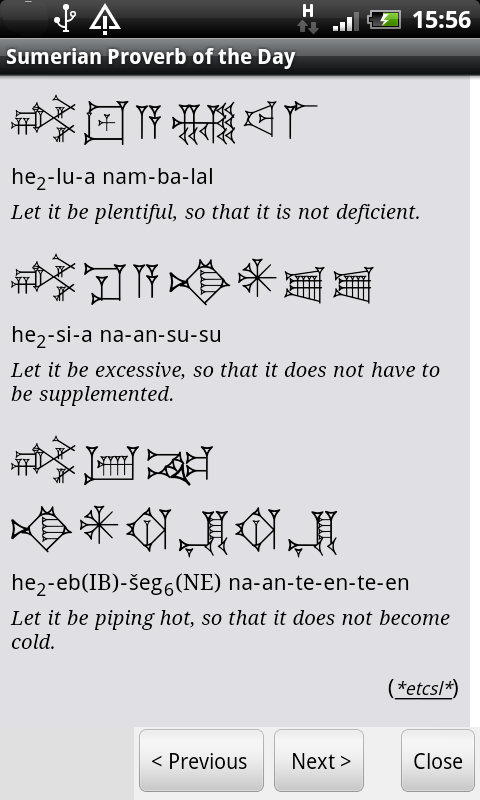 You should not say to Ninĝišzida(God of the Underworld): "Let me live!" Let it be plentiful, so that it is not deficient. Let it be excessive, so that it does not have to be supplemented. Let it be piping hot, so that it does not become cold. You speak with me and I speak with you. Like an ox, you do not know how to turn back. Offerings are the glory of the gods. The strength of my god completes my own. "I will go tomorrow" is what a shepherd-boy says. "I will go" is "I will go", and the time passes. You are still my son, even if your god has turned against you. It is an insult resulting from an insult. It is a curse resulting from a curse. It is the constant renewal of destiny. A curse which is reciprocated will be retaliated against with yet another curse. Fate is a raging storm blowing over the Land. You're a scribe but you don't even know how to write your own name? 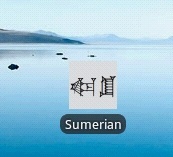 who does not know Sumerian? but his handwriting is good, he is indeed a scribe! Those who get excited should not become foremen. A shepherd should not become a farmer. is known by the heart of the tree. Whether he ate it or not, the seed was good. Tell a lie and then tell the truth: it will be considered a lie. he who has livestock can sleep. It is a thing of short duration. Whatever it is that hurts you, don't talk to anyone about it. He who possesses many things is constantly on guard. You don't speak of that which you have found. You talk only about what you have lost. The good thing is to find it. The bad thing is to have lost it. The two of them are like one man. He did something never seen before. Having children is from the gods. A loving heart builds houses. A hating heart destroys houses. at the place where a lion has eaten a man. Don't choose a wife during a festival! He who knows but does not speak is a fool. Although it has never been there, the goat knows the waste land. Like a dog you have nowhere to sleep. Control the dog, but love the puppy! He is a dog without a tail. for if you do, to succumb will be your lot. then his sheep will not return. how weak I would become!" I looked into the water. My destiny was drifting past. May Inana pour oil on my heart that aches. Before the fire has gone out, write your exercise tablet! The heavens were destroyed, the earth was shaken. the people were still standing there on their own. For him who is rejected by Inana, his dream is to forget. The time passed, and what did you gain?